Mobile app technology is advancing at what feels like a breakneck pace, with new "must have" features and functionality evolving almost daily. In order to succeed in the mobile space, businesses and developers need to stay at the forefront of trends-or get dominated by the competition. Find out about two of the hottest topics surrounding mobile app development right now-social media and HTML5. 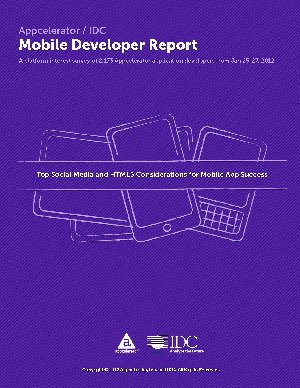 In a recent developer survey report from IDC and Appcelerator, you'll learn why social media is a critical component for user engagement and content distribution, and why HTML5 could be the key to building richer, more dynamic and more user-friendly app experiences. Plus, learn what 2,100 experts closest to mobile innovation think about the future of social media and the role of HTML5-and compare their predictions to your own strategies. Educate yourself on the backend of mobile app strategy and use your knowledge to stay in front of the competition. Download the survey to get all the details on the latest priorities, plans and predictions from mobile app developers.